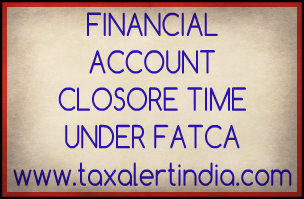 The Inter-Governmental Agreement (IGA) with USA for implementation of FATCA entered into force on 31st August 2015. Under the alternative procedure provided in Rule 114H(8) of the Income-tax Rules, 1962, the financial institutions need to obtain self-certification and carry out due diligence in respect of all individual and entity accounts opened from 1st July 2014 to 31st August 2015. Such self-certification and documentation was required to be obtained by the financial institutions by 31st August 2016, otherwise they were required to close the accounts and report the same if found to be a "reportable account" as per the prescribed due diligence procedure for preexisting account.